A brief history of the breakers should start with a story about a modest Myrtle Beach, South Carolina, summer home converted into a well-known boarding house in 1929. Nearly 80 years later, The Breakers can no longer be described as having a wide front porch adorned by a few rocking chairs. It's now 20 floors of Mediterranean charm with a buccaneer-themed water park. The main building offers a massive indoor pirate ship to swim through, and murals of swashbucklers line the indoor/outdoor, 418- foot lazy river facing the Atlantic Ocean. The resort has even earned a nickname during its short lifetime. The Towers, as it is referred to locally, remains in a class of its own. Whether you are a savvy investor, seeking a vacation getaway or considering retiring on the ocean, this resort offers something for everyone. You can park your car in the private garage complex across the street, and take advantage of the many amenities within walking distance. The resort is only minutes away from the shopping extravaganza Broadway at the Beach and The Myrtle Beach Convention Center. Its location is not its only selling point, however. Homes at the Breakers Resort, though growing in value, are still moderately priced for the Myrtle Beach area. Fully furnished and loaded with extras, units range from the studio level all the way to the three-bedroom corner units. Efficiencies can be purchased for as little as $260,000. 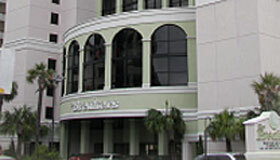 The Breakers Resort is located on the Atlantic Ocean, at 21stAvenue North in the heart of Myrtle Beach. Offering both a trip back into history and a look into the future, the new Breakers continues a legacy of elegance and comfort. For more information, contact Glori Marion of Elliot Realty at (843) 997- 4031 or at glori@elliotgmac.com.